A joyful tour with the e-bike along the most beautiful places in Saalfelden-Leogang. Sabine is an extremely warm and positive person, that you immediately enjoy spending time with. 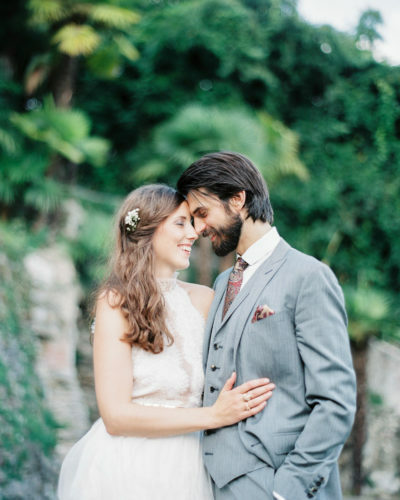 Together with her husband Adrian, she runs the biking school "elements" enthusiastically. 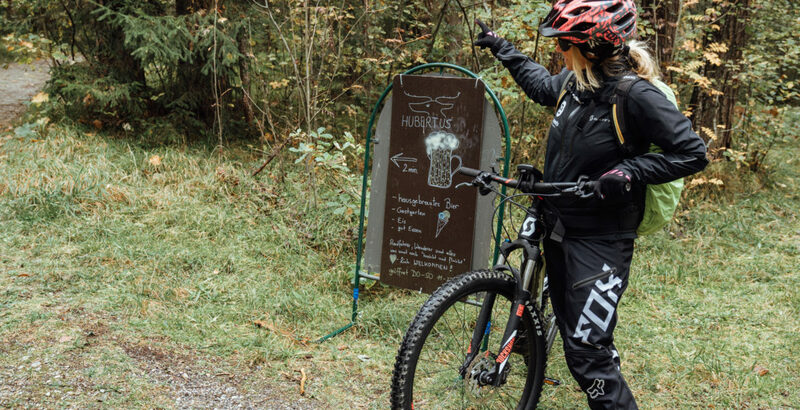 She has turned her biggest passions into a profession: biking, downhill, enduro. 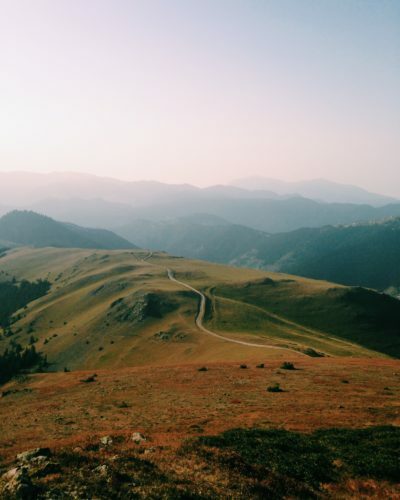 Courageously you see them going up and down the mountains or teaching others. On the bike in summer, on skis and snowboards in winter. 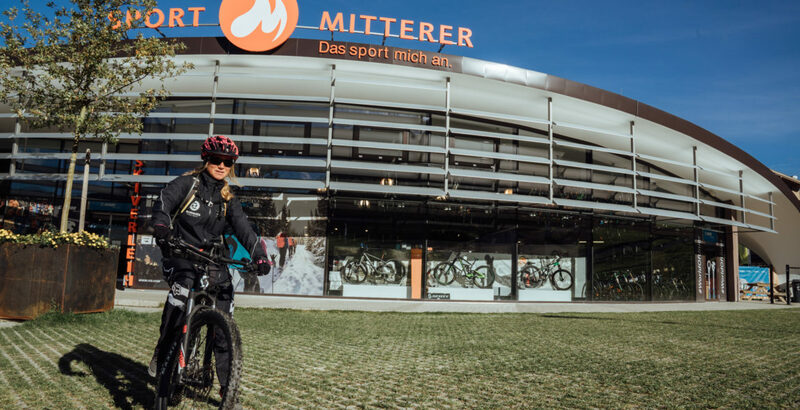 E-bikes are a great way to explore the region Saalfelden-Leogang, tasting wonderful regional products and exploring some of the most beautiful places. We start at the biking school elements and borrow 2 e-bikes from Scott. With these easy bikes any mountain is climbed immediately. The school is located in Sport Mitterer directly at the Asitz valley station. So, if you want to, you can get dressed up with one or the other accessory on site. 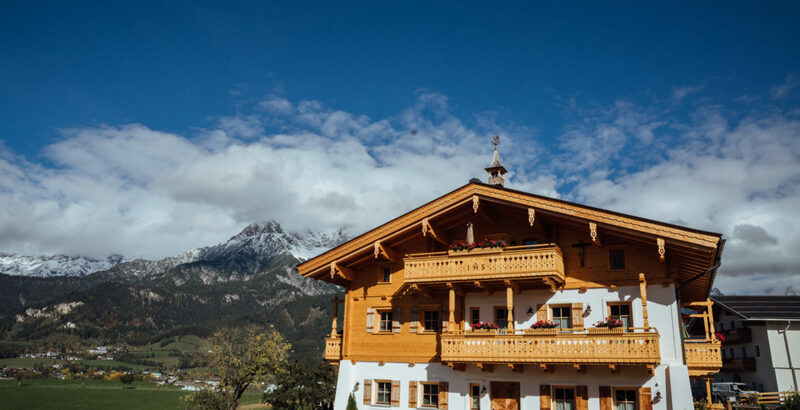 From there, we first go to the Hotel Salzburger Hof, to strengthen us with a coffee and a small breakfast for the tour and especially to discuss the route. Over a beautiful path decorated with autumn foliage we pass by Hotel Krallerhof and arrive at our first stop: the village shop in Leogang. Here you can buy local delicacies, talk about the last gossip of the village, drink a coffee, buy a small souvenir and eat homemade cheese dumplings. The path continues and we see beautiful old farms with magnificent flower boxes, curious horses and cute baby calves. 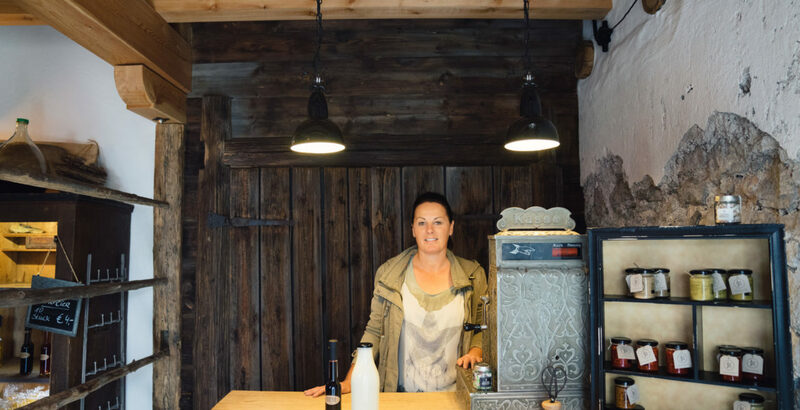 Our next stop leads us to a true Local Soulmate: Erni Tribuser. Mother of 4 adult sons and passionate schnapps distiller since 1996. Homemade liqueurs, juices and jams are also available. The raw materials come to a considerable extent from the own orchard. With a bottle of apricot brandy (thanks Erni! 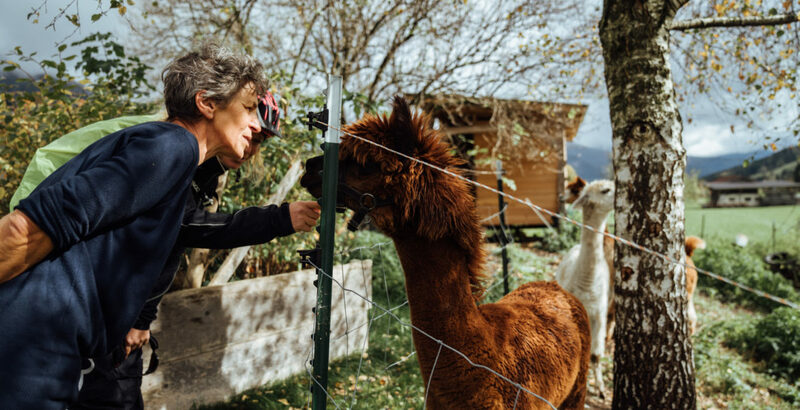 ), a nice conversation about God and the world, a tour in the garden and welcoming the 3 funny alpacas of Erni, we are on our way again. Next stop: the Zieferhof in Otting. 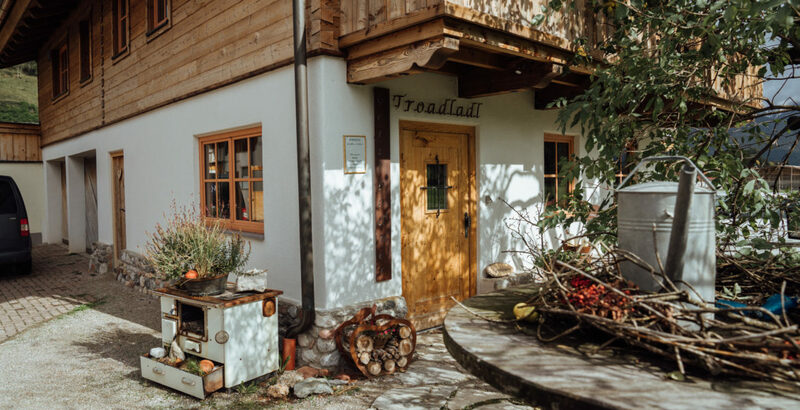 In the own village store “Gerstbodner Troadladl” one can buy the high-quality dairy products of Mei Muich, which are also offered in some of the local hotels like the Forsthofgut, Puradies or Biohotel Rupertus. After a delicious raspberry yogurt, go on to the Stechaubauer. In the self-collection station, anyone can buy 24/7 organic vegetables. Such a cool idea! 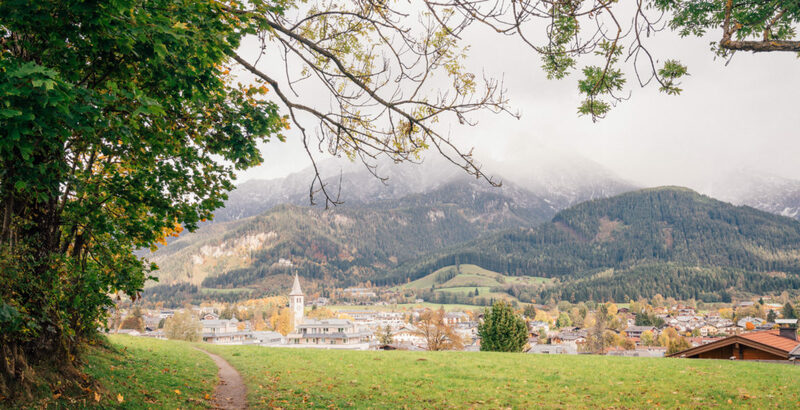 The beautiful, picturesque fields with the Leogang stone mountains in the background only arouse the desire to taste all the products that grow here. The next farm shop on our joyful tour is a real gem: HPH anno 1905 in the former, lovingly redesigned horse stable. Organic butter, cream cheese in oil, cottage cheese spread, eggs of organic chicken, bread, oil, pasta, liqueurs, … here anyone will find something. And also a must-do on our tour: honey from the beekeeping Höttl in Saalfelden. Especially to be recommended the honey vinegar and the cream honey with roasted almonds. Through a small forest path it goes to the Gasthof Hubertus where there is very delicious food and beer from the own brewery. After the morning was rather cloudy and cool, the sky suddenly breaks open and rewards us with sunshine and blue sky. Wow! That only exists in the mountains. The perfect moment to go up to the Ritzensee and enjoy the view on the Steinerne Meer and the Leogang stone mountains. Once at the top, we return to the beautiful Klampfererhof and enjoy a local specialty: Pinzgauer Bladl! Stuffed leafy donut with sauerkraut. Good that we have already driven so far today. Then take a few pictures of the garden with a view over the Ritzensee, breathe in the cool autumn air and be happy to be alive and enjoy the beauty and hospitality of the world in such a wonderful place. The schnapps distillery Siefgfried Herzog distillates I still recommend for a small gift or delicious cheese. 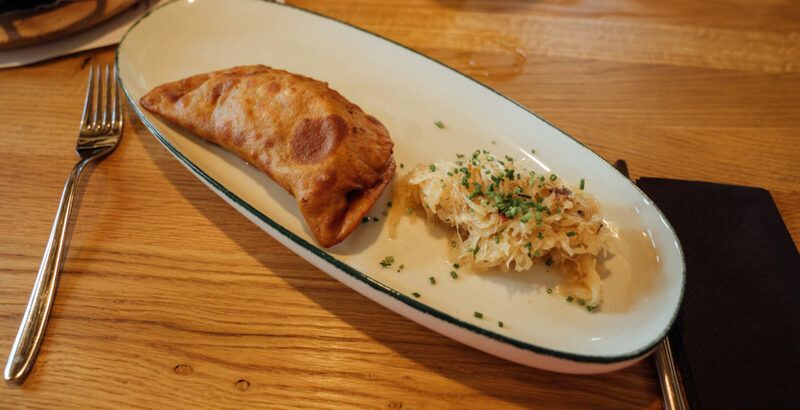 On the way back from Saalfelden in the direction of Leogang, at the end of the round you should definitely take a break in the Sinnlehen Alm for a delicious snack. From there you have a great view and can review the tour. We also drive into the town of Leogang again and look past the listed traditional Kirchenwirt. The oldest restaurant in the province of Salzburg, first documented in 1326. If you are still looking for a room, you can spend here the night in tastefully restored rooms. We conclude our tour with a small ride through the bike park, hugging each other at the end and then we are completely filled with so many impressions of beautiful nature painted in autumnal colors. I love to share the best parts of my homeland with others. Enjoy “my” Saalfelden-Leogang guide and if you like to, visit me in the bike school. Ride on, your Sabine. The sports shop in Leogang, including a large bike rental. From mountain bike to e-bike. Everything the athlete's heart desires. This bike school is passionately run by Sabine Enzinger and her husband Adam. For big and small, professionals and beginners: mountain bike, bike park, technique training and much more. 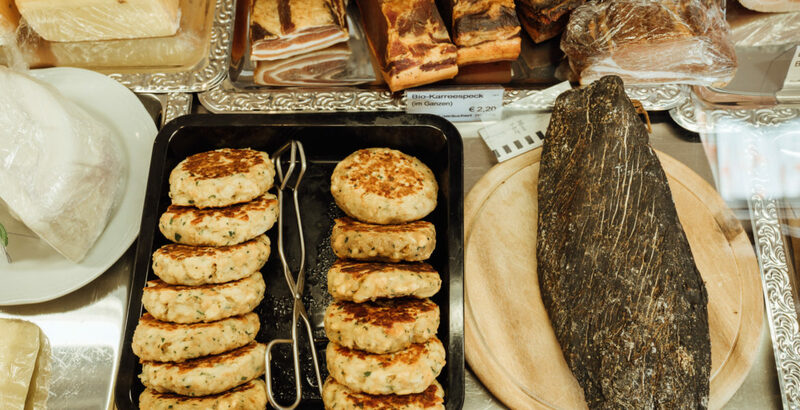 Regional delicacies, magazines, tasty cheese dumplings and whatever else you need. In the middle of Leogang. 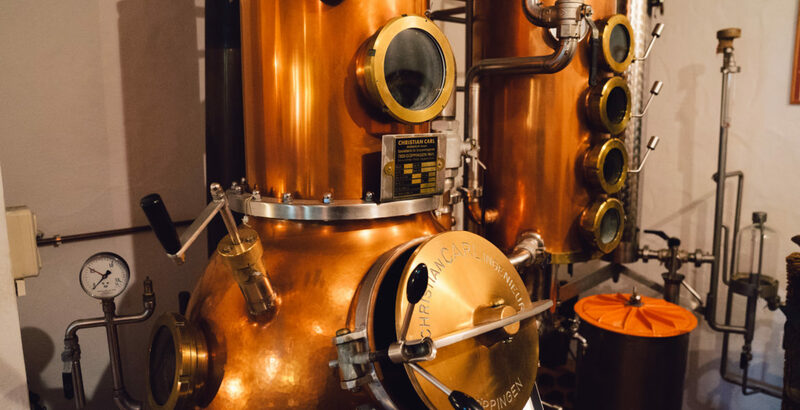 Since 1996, Erni and her husband have been working intensively on the distillation of fine brandies made from stone- and berry-fruit. You can come straight to the distillery and buy something. delicious milk products of "Mei Muich". From fresh milk to creany yogurt - all from their own manufacturing. Small shop with a great idea: a 24/ self service concept for fresh regional products. Very nice village shop with delicious regional products. A beautiful artificial moor lake. 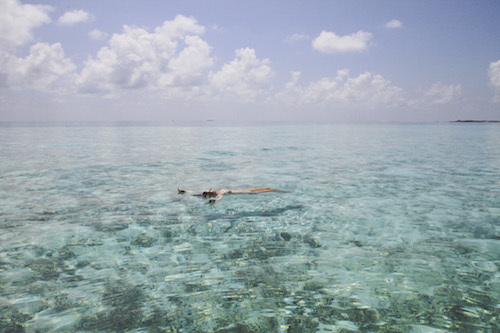 Ideal for swimming in the summer. 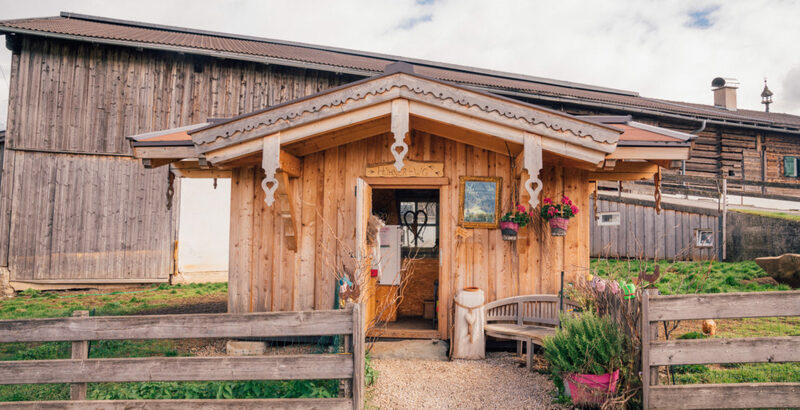 Organic farm and small inn with delicious food and views over the Ritzensee. Eine schöne Alm mit leckerer Jause. Beim Wandern oder Biken ein sehr schöner Ort zum Entspannen mit tollem Blick. The place to be for bikesport enthusiasts: downhillers, freeriders and mountain bikers! The Bikepark Leogang is one of the first and largest bike parks in Europe, and will be the venue of the UCI Mountain Bike World Championship for the second time in 2020. So, who wants to drive demanding World Championship circuits is right here! Even children and beginners who want to try their first jumps in the Riders Playground are welcome. As a starting point for every tour directly opposite our bike school elements. Here you can briefly strengthen or spend the night directly at the lift. For those who want to be the first on the slopes. Fantastic food in the heart of Saalfelden. The restaurant and bar are a must when visiting here. "If Lukas Ziesel is in his kitchen, then he is exactly in his element, you can not only see it, you can taste it." Homemade honey specialties. Our favorites: honey with roasted almonds and honey vinegar. Organic, organic, organic. 100% organic hotel. For all true nature lovers, the hotel in Leogang. 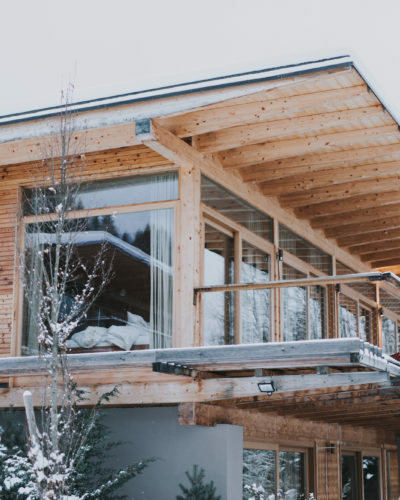 One of our favorite hotels in Leogang. Very family friendly, beautiful spa area with 25m pool and views of the Leogang mountains, top service and warmth. Beautiful hotel and chalets. A true holiday trail! Stylishly decorated, top SPA area and delicious food. Wow! Traditional inn with its own brewery and a beautiful garden with great views. 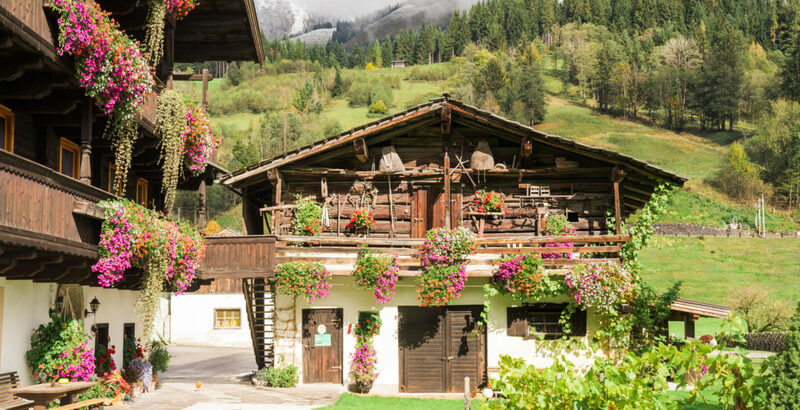 A beautiful, tasteful, legendary hotel in the middle of Leogang and the oldest inn in the Salzburger Land. Here you will find the perfect gift. From schnapps, to cheese and beautiful gift baskets. 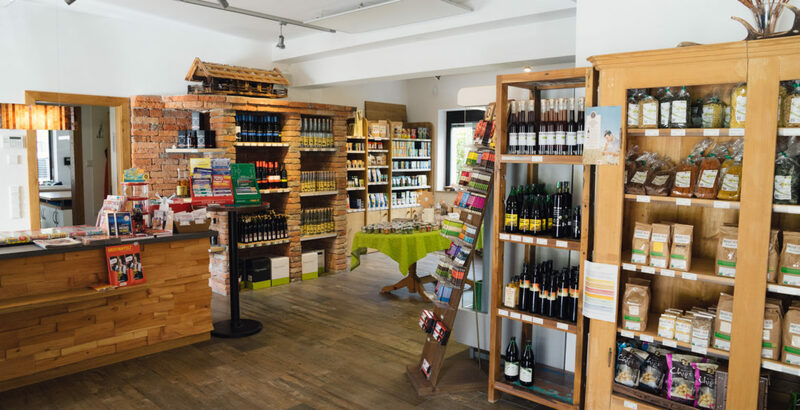 "The local farm shops and products here are made with so much love, thoughtfulness and soul!" Super delicious products of "Mei Muich"
Joyful ride with the E-Bike through autumn wonder land. Me and my love Adrian run our bike school ELEMENTS, pass by! Golden leaves on our way through Saalfelden-Leogang. Village shopping with super delicious regional product. 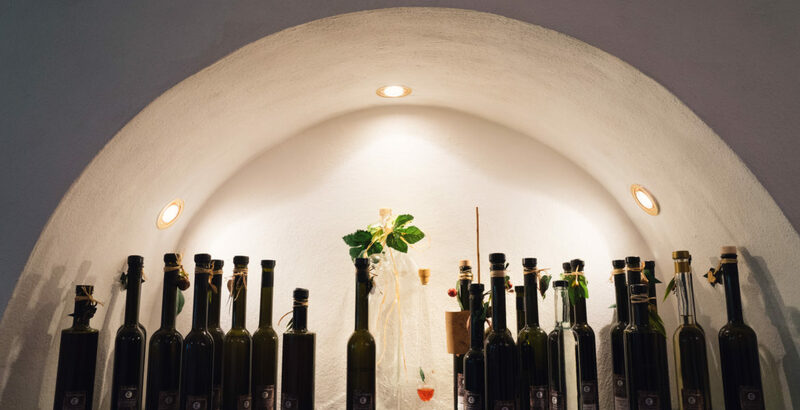 Definately try the Austrian Specialty "Kaspressknödel"
Erni Tribuser is an institution in the region, take your time and enjoy a schnaps in her place! All liquors are housemade with ingredients from her own garden. These 3 funny alpacas welcome us, when arriving at Ernis place. 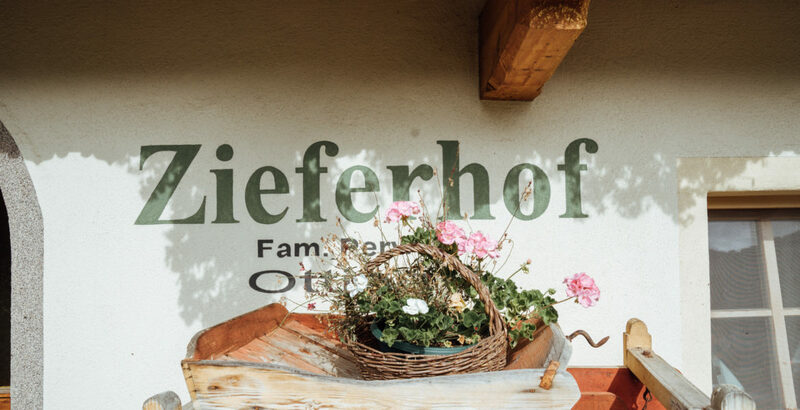 On our journey we stop at Zieferhof to get some "Mei Muich" products. 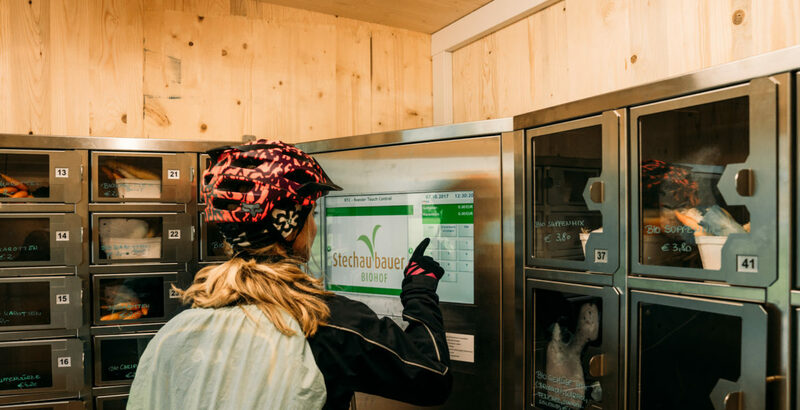 Such a great idea at the farm Stechaubauer: a 24/7 shop for regional products. Our visit at the beautiful farmer shop HPH anno 1905. "This way" to Gasthaus Rubertus for a freshly brewed beer! Having a joyful lunch at Klapfererhof. A regional specialty: Bladl Krapfen! And back home to Sport Mitterer, where we rented our bikes. I love nature here. The opportunity for sports enthusiasts in summer and winter. Actually during all 4 seasons. The mountains and the many locals who are passionate about their products, projects and places. Discussing the route of the day at Hotel Salzburger Hof. Erni Tribuser: mother of 4 sons and passionate schnapps distiller. A great idea! Organic vegetables around the clock from Stechaubauern. Homemade honey from the beekeeping Höttl. Wunderschöner Blick über den Ritzensee in Saalfelden. At the end past the legendary Kirchenwirt: Great hotel and oldest tavern in the Salzburger Land. Some people get wet others feel the rain. WHAT MUSIC FITS BEST TO YOUR DESTINATION? The sound of silence after the opening hours of the cable railway. WHAT SMELL DO YOU ASSOCIATE WITH SAALFELDEN-LEOGANG? The fresh fragrant of mountain air. WHERE IS YOUR PERSONAL “ENERGY PLACE”? The hermitage “Einsiedelei” or any mountain peak in our region. WHERE DO WE FIND THE BEST PARTIES? Party? – actually I am not a party girl anymore  I rather meet with friends, play the guitar at a campfire in our garden or in the mountains. If I go out, then it will most probably be Mama Thresl in Leogang! YOU HAVE TRAVELED SO FAR, WHY ALWAYS COMING BACK TO SAALFELDEN-LEOGANG? The four seasons here in Leogang. They all have such a strong contrast to each other as nowhere else. … a journey to your self. … an experience, which supports your journey to yourself and opens ones eyes for new perspectives. HOW IS IT TO WORK WITH YOUR PARTNER? YOU TWO ARE RUNNING THE BIKING SCHOOL ELEMENTS? I think, one really must want it! Definately not all couples are made for that, but we do love it! And we love to support each other in everything. Real Soulmates.